If you’re in need of a gift for a jazz aficionado, you can’t go wrong with Cabaret Echoes, a joint project from master restoration engineer Doug Benson and jazz historian David Sager. 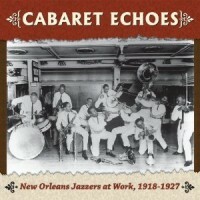 The 2 CD set features 40 of the earliest and rarest recordings by New Orleans groups, including the six surviving sides by Kid Ory’s Sunshine Orchestra, the first African American New Orleans jazz band to record. Not only have the selections been meticulously transferred using the best possible source material, but many of the tracks include spoken introductions by the musicians, culled from oral histories held by Tulane University’s Hogan Jazz Archive. The packaging includes a 60 page booklet lavishly illustrated with photographs of the musicians, early advertisements, rare record labels, and sheet music covers. David Sager, a jazz musician and former resident of New Orleans, authored the wonderful liner notes which will likely garner him another Grammy nomination (he was previously recognized for King Oliver: Off the Record). This is another jewel in the crown for Archeophone, one of the few American-based reissue labels that consistently produces CDs that are not only of great historic interest, but expertly mastered and packaged. This entry was posted in Jazz by aaamc. Bookmark the permalink.